This post shows how to update properties file in Java. 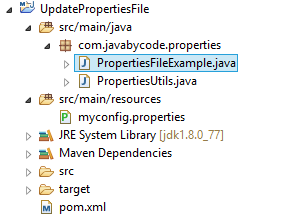 As you know, Java Properties API doesn’t support update properties file dynamically. While properties files are a popular mean of configuring applications. Fortunately, Commons Configuration API supports this format and enhances significantly the basic Java Properties class. Here we will use Commons Configuration API to update properties file dynamically. Notice that the classpath is really src/main/resources directory. You can see this file in the project directory structure. Run above main and we get the output like screen shot. That’s all on the How to update properties file in Java tutorial. Why did you not use latest commons-configuration2 dependency? Please make a tutorial how to autoreload .properties at runtime without restarting server when they are changed in file system and not programmatically. And how to read new values from reloaded file.